Much of the landmark speech on combating extremism delivered by the British prime minister on July 20th focused – naturally – on the issue of tackling extremist ideology. First, any strategy to defeat extremism must confront, head on, the extreme ideology that underpins it. We must take its component parts to pieces – the cultish worldview, the conspiracy theories, and yes, the so-called glamorous parts of it as well. Second, as we counter this ideology, a key part of our strategy must be to tackle both parts of the creed – the non-violent and violent. This means confronting groups and organisations that may not advocate violence – but which do promote other parts of the extremist narrative. In light of David Cameron’s words it was remarkable that less than a week after that speech was made, the BBC (which is of course committed to “sustaining citizenship and civil society“) chose to broadcast a programme on Radio 4 made by a journalist known for promoting the notion of a scary ‘Pro-Israel lobby’ with extraordinary influence and control over British politics. 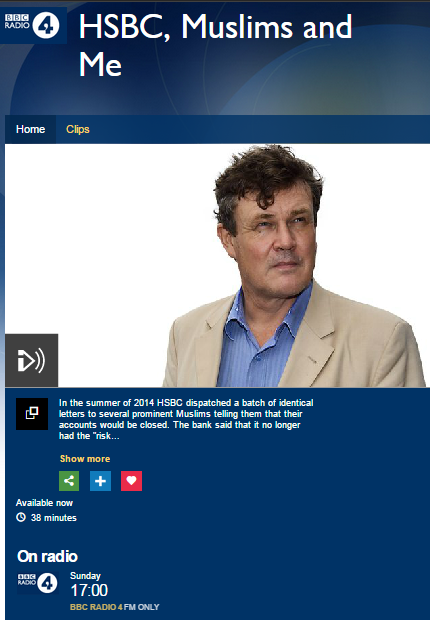 All the more unfortunate was the fact that Peter Oborne’s programme – apparently commissioned by the BBC and aired under the title “HSBC, Muslims and Me” on July 26th – not only whitewashed known supporters of Hamas in the UK, but did so using promotion of false “context” concerning discrimination against British Muslims in general. 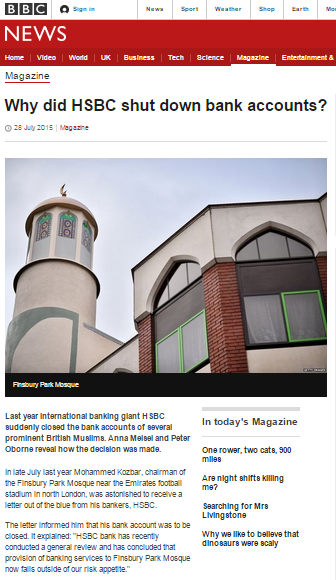 In spite of that sweeping claim, both the article and the radio programme relate to the closure of the bank account of one organization – the North London Central Mosque, also known as Finsbury Park Mosque – and one family – the al Tikriti family. Two other organisations also had their bank accounts closed around the same time – Anas al Tikriti’s ‘Cordoba Foundation’ and the Ummah Welfare Trust – although neither of Oborne’s reports clarify that fact. “There is a deeper and more troubling context here. He finds an Islington councillor who tells him that HSBC’s closure of the Finsbury Park Mosque’s account is “smearing by innuendo” and Oborne tells listeners that he has “long worried that British Muslims are being singled out for unfair treatment”. He also declares that the subjects of the programme – whom he describes as “some friends of mine” in its opening seconds – “as far as I can tell have no connection with terrorism”. The three people named in Oborne’s report are Anas al Tikriti of the Cordoba Foundation, Mohammed Kozbar of the Finsbury Park Mosque (and numerous other organisations) and Mohammed Sawalha – also a trustee of the same mosque. “The World-Check entry on Finsbury Park Mosque also contained the information that Mohammed Sawalha was a trustee. Sawalha is believed to be one of the most senior Muslim Brotherhood figures in Britain. 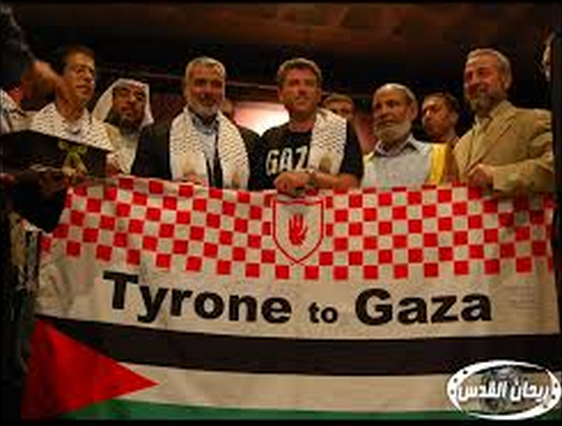 He is also alleged to have been a Hamas commander in Gaza 25 years ago. Hamas is designated by the US and other governments as a terrorist organisation. A similar account appears in the audio report at 32:43. Sawalha’s days as a Hamas commander were actually spent in Judea & Samaria rather than Gaza but that minor inaccuracy is symptomatic of Oborne’s broader failure to conduct any serious research on his protagonists’ backgrounds and connections. 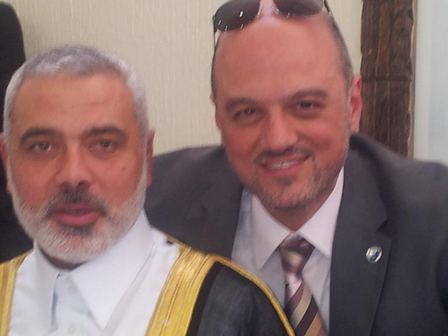 In addition to his links to assorted Muslim Brotherhood organisations – including the ECESG which played a central role in organising the 2010 and 2011 flotillas – Sawalha was named in a terrorism financing trial in the US in 2008. That information – which is amply available in the public domain (details of the case’s background even appear in the transcript to the 2006 Panorama programme linked to in the written report) – is obviously extremely relevant to Oborne’s subject matter and yet he chose not to impart it to his readers and listeners, preferring instead to amplify Mohammed Kozbar’s smoke and mirrors. 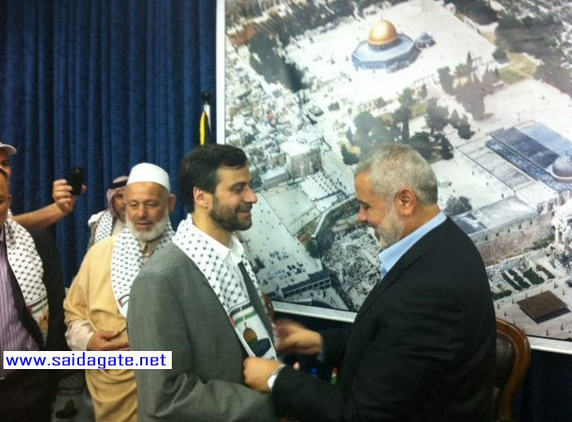 That local MP, by the way, is Jeremy Corbyn – recently in the headlines due to his Hamas “friends”. “Khalid Oumar, one of the trustees of the [Finsbury Park] mosque, questioned the motives behind the letters. “The letters that have been sent and the letters that we received do not give any reason why the accounts were closed in the first place,” he said. That 2014 BBC article made no effort whatsoever to provide audiences with information concerning the links of the organisations and individuals concerned to the Muslim Brotherhood and their common denominator of support for Hamas. A year of potential research time has now passed but whilst Oborne does mention his subjects’ links to the Muslim Brotherhood, he provides nothing in the way of concrete information about that organisation’s links to terrorism or their records of support for Hamas, its terrorism and its mission of eradicating Israel. 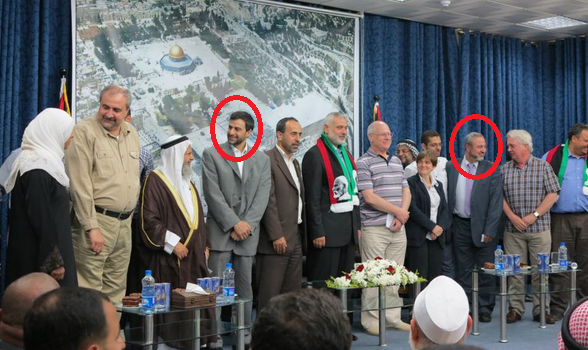 Oborne’s all too apparent adoption of the role of advocate for individuals and organisations supportive of the terrorist organization Hamas is not unexpected and neither, sadly, is the BBC’s decision to provide a platform – and presumably payment – for his agitprop. But there is a deeply unsettling aspect to the BBC’s decision to promote Oborne’s whitewashing of the links of known extremists by means of the canard suggesting that all mainstream British Muslims may be subjected to exclusion and discrimination just at the time when the British government is taking on the battle of combating extremist ideology and narratives.